And that is another PNG project complete for another year, until 2019. The week has drawn to a close with 11 life changing surgeries being completed, not to mention the countless hours of training and education. Yesterday was the last day of surgery with 11 cases completed by the PNG and OHI team. Another day passes and more teaching, skill transfer and surgeries have been done in PNG. The OHI and local team have started surgery at Port Moresby General Hospital with continual skill transfer and training as their main goal. The team are hitting top gear in Fiji for another year. There is a lot of girl power going on with this team of professionals. A sneak peek into a patients world as well as the operating theatres. The team is pulling together to have a successful week ahead. The successful education training has come to an end, now for surgery. Another day in Yangon with plenty happening across all areas. Teaching is the major part of our project goals in Papua New Guinea. Day two in PNG and two patients are in ICU transitioning to the ward. A team of 17 volunteers have arrived in PNG to provide paediatric cardiac surgery. The team have had a successful training course the week before the main team arrived. The team are working well together to ensure the best outcome for our patients, it is all about best practice! The team of 32 volunteers have arrived in Dar es Salaam, Tanzania for OHI's last project of 2017. It has been a very busy eight days for the Open Heart International team with 84 patients receiving life changing surgery. It was not a typical weekend for two of our volunteers who headed out to meet up with past patients. At the end of our first week here in the Philippines the team have completed over 60 eye surgeries. The Honourable Minister of Health Dr Said Ma'u Piukala sat down to talk OHI. Dr Liz is one of our surgeons from Papua New Guinea who has joined the team in Tonga. The adult week has come to a close, but the paediatric week has begun! The atmosphere of the team is great with everyone working together. Paediatric week commences and Adult surgery continues. The surgeries are in full swing and the team are loving the Tongan hospitality. The main adult team are in Tonga ready to begin. A day in the life of a patient. The farewells, packing and final handovers are all underway for the teams departure today. Friday saw the last day of cases for the team in PNG and 11 children have received life-changing surgery. There are a few first time volunteers with our team in Papua New Guinea. Everyone is getting into the routine in Papua New Guinea. The first day of surgery is done and dusted. Melanie Windus, Project Coordinator has some final words on the 2017 OHI Fiji project. Dr Subodh Ganu is a paediatric Intensivist from South Australia, who has had the pleasure of joining the OHI team for a second time. Krystal Jolly is a first time volunteer with Open Heart International and reflects on the past weeks experience. 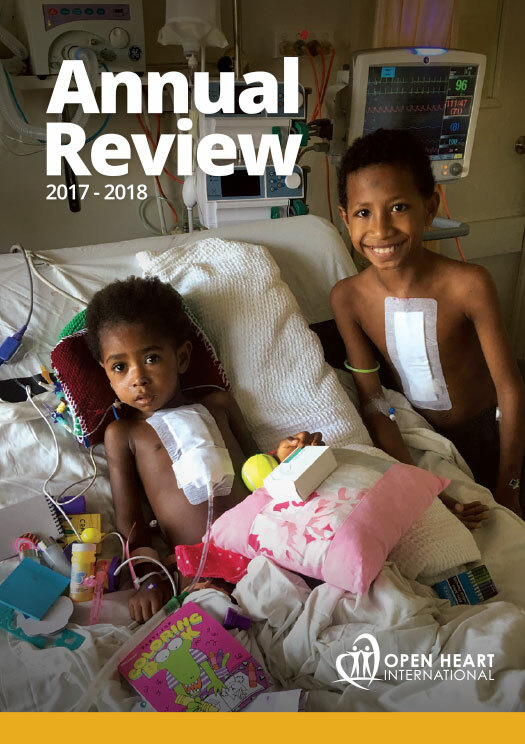 There are new beginnings all around with first time volunteers from NZ experiencing Open heart International, as well as our 800th Patient in Fiji having life changing surgery. After a number of hiccups along the way, the team are powering full steam ahead - unstoppable! David Baines has been a long-term volunteer of Open Heart International and it is his final trip to Fiji after attending 20 projects. Last week a team of seven volunteers travelled to Fiji to complete the screening in time for the surgical team in June. Jakaya Kiwere Cardiac Institute is the biggest national referral Hospital. A snap shot of what a day looks like over three Hospitals. A busy couple of days in Myanmar. The team is back in Myanmar, starting off 2017 for Open Heart International. We are looking for a volunteer to assist in our day-to-day management! Dr Simon Erickson, a paediatric Intensivist on the mission to Tanzania shares his highlights of the project. Great news, the second lot of consumables have arrived. The setup and preparation is complete for the surgeries to begin. The team have all come together to get everything set up for surgery tomorrow. After 10 amazing years and 11 projects, the Cambodia cardiac project has finished. Is the body really like an ants nest? Keeping patients active is the priority. The screening process continues, and the first surgery is underway. In consultation with our colleagues at Port Moresby General Hospital, Open Heart International has made a decision to aboard the scheduled delivery to Port Moresby later on this week. The team have recently arrived on the first trip ever to India and are getting acquainted with the city. Click on the images below to download each Annual Review. 13 Children has received life changing surgery in Dar es Salaam, Tanzania. Dr Godwin Sharau is Tanzania's first paediatric cardiac surgeon. Open Heart International's team overlaps with a similar project - Little Hearts. Jen Evans, one of Open Heart International's long term volunteers talks about her time in the Navy and contributing to OHI. The team attend an offical celebratory dinner held by the Rwandese hosts. Our perfusionist had never left her home town in India before this trip. Our volunteers come from all over the world. Teresa Duncan is our paediatric Intensivist volunteer in Rwanda. Steph, one of Open Heart International's volunteers shares on how she came to volunteer with us. Some of the OHI Volunteers get a taste of the local Rwandan church. A little insight into how the process of patient selection works. The first day of surgery in Rwanda is complete. The team have arrived in Kigali and set up has begun. Whose heart is being repaired? There is further exploration of PNG to be done..
Each day brings it's joys, challenges and routine. Ariane Annicq is one of our new additions to the OHI volunteering team. Education is a key part of Open Heart International's project in Papua New Guinea. A team of 28 volunteers have arrived in Cambodia to assist Angkor Hospital for Children for the week. Dr Ian Nicholson was today announced as a NSW finalist in the Australian of the Year Awards. Shop for a cause- A new and free way to support us! The ward is coming to life! The ward is coming to life with eight post-op patients, four to be discharged today. It's not just marketing spiel, it is true! For many patients this process will be nothing but a distant memory in a few months time. Out of 27 volunteers 4 of these were Susan's (with various spelling). Next year Open Heart International will be returning to Papua New Guinea to work on both paediatric and adult cardiac services two times. Liz is a first time volunteer with Open Heart International. NEWSFLASH: Watch 60 minutes this Sunday! We are very excited to be part of 60 minutes this Sunday night - make sure you tune in on Channel 9! 36 patients have received life-changing surgery in 6 days of operations. All donations given to Nepal Burns and Women's health projects will go towards the Emergency aid of patients at the Scheer Memorial Hospital. Our Biomedical engineer La is often known as "Mr Fix it" as he fixes blood gas machines to coffee machines. The team are in East Africa for only the second project to ever take place in Tanzania. Unfortunately burns happen more frequently in Nepal than you may think. Read some of the patients stories from this year. It is a roller-coaster of emotions on the trip, but one well worth it. Jennifer Vinton, one of Open Heart International's regular sponsors, visits Cambodia. The cardiac team lands in Cambodia, and first day of screening is complete. The team have had an interesting journey to even get to Nepal, now for the project to start. One of our volunteers, Ian Moore teaches the staff in ICU at Yankin Children's Hospital. The Angiography team in Myanmar have had a busy start to the week. A team of 33 volunteers are in Myanmar providing training in three hospitals throughout Myanmar. Shop Online and support Open Heart International for free! Daniel shares what it means to be in Tanzania. The first day of surgery is under our belt with three operations complete. The team are getting familiar with Tanzania, meeting the staff and getting to know the hospital. It was a last minute rush to get Nicole to Rwanda, but she is loving the experience. Another year is nearly over with another successful Cambodian trip. We first met Vath in March last year, he came back to have his second and final surgery. Having fun is a great step to recovery! Does East Africa spark an interest? The team has been home for a few weeks now, Chris Waite, the Myanmar Project Coordinator says a big thank you to all involved. It has been a great couple of days in Myanmar with the transfer of skills to the local team. Michael Were, manager of Open Heart International is interviewed on 2UE radio station. The Mosman Rotary Club recently celebrated their 10 year partnership with us at Open Heart International Myanmar. Another year comes to an end in Nepal for the Burns surgery team. All trips are filled with all different types of emotions. Take a look into the life of a Nepali family and see why so many burn cases occur. In conjunction with the Fiji Ministry of Health, and after much consideration Open Heart International has decided to cancel the planned surgical visit in May 2014. April marked the 5000th Patient for Open Heart International, what an achievement! Today marks the 5000th Patient for Open Heart International, what an achievement! Another year is over in the Philippines with 153 patients having their sight restored. OHI Philippines major goal is to make the project self sufficient at Adventist Hospital Santiago City. Things happen a little differently in the Philippines, the chapel has turned into a patient overnight dormitory. Over 100 patients were assessed today, 40 of these cases will have surgery which begins tomorrow. The Binwican family return to have a check up and thank the team. The first 48 hours of the Nepal Burns Team trip for 2014 has seen tired eyes and polo shirts lead the agenda. 5 year old Shaira receives sight as well as a full chance at life. The team travel to a remote village to find people who are suffering from avoidable blindness. Our youngest OHI sponsor busked around Sydney raising money for one little girl in Cambodia to receive heart surgery. It can be providing personal care bags, smiling at a patient or taking a photo then asking them their story. It sometimes starts off as a small act but so often can make the world of difference. OHI Cambodia are off again and are all really excited to be back on the road again. Sophie Stone, the President of the Paramus Sunrise Rotary Club, USA comes for a visit. What's an average day like in Myanmar? The team have arrived in Yangon and have started their work across three major hospitals. Rwanda Project Coordinator Russell, gives his end of year wrap up. Our time in Kigali draws to a close. Find out what it is like to volunteer with us directly from those on their first OHI trip. Tuesday proved to be a challenging day for the OHI team, for a number of reasons. Members of the OHI team visit the Missionaries of Charity orphanage in Kigali to follow a patient. The steps a OHI patient goes through. The first few days in Kigali are all about organisation and unpacking. Travelling with 80kg excess baggage and arriving in Kigali. Final words from the Cambodian Project Coordinator. Our blogger spends a day in the operating room. The first patients are operated on at Yankin Hospital. Cambodian Children to benefit from Northern Beaches Fundraiser. Packing for the 2013 Open Heart International Rwanda trip began on Sunday. Herbie's second operation has been completed and his life has changed dramatically since the first. Dr Arvin Karu is interviewed on Pacific Beat program. Ian has one of the more unique roles in our OHI team. We have two Hawaiian's joining our team this year in PNG. On the road to recovery, this is their last Aussie stop. On Wednesday August 7 there will be a shawl stall raising money for patient care in Nepal. The stall will run from 10am to 1:30pm Outside San Café. Join us on a coastal hike on Sunday the 29th of September, 20 km from Narrabeen Lakes to Palm Beach, to help raise money to sponsor Cambodian kids through complex heart surgery. Kondo has a second operation with the OHI team. A multimedia presentation on his experiences as part of James Cameron's DeepSea Challenge Expedition. Our Intensive Care doctors lend a hand to the local paediatric surgeons. Our amazing anaesthetics team are the first team to help our patients. The team and the welcome party at the Yacht Club. The main team has landed in Port Moresby. Setting up and preparing in Port Moresby Hospital on day 2. Trying to create a self-sufficient program in Papua New Guinea. The early team has arrived to unpack and start teaching. The team packs in anticipation for the upcoming Papua New Guinea trip. A mentorship starting after a Open Heart International visit has led to a new cardiac surgery unit in Yangon. With the official launch of our new name Open Heart International, the next chapter of our exciting journey has commenced. Donated goods arrive just before our team and will make a huge difference to the Scheer Memorial Hospital. One good deed in Nepal deserves another, many of the team do more than just volunteer with OHI. Some patients stay in your mind and this one is one of those. All shifts are shared to build cooperation between the OHI team and local staff. The goodbyes and thank yous from another successful trip. The team at the Scheer Memorial Hospital help make the Open Heart International trip a success. The team have set up and started the assessment process. Many team members return to Nepal year after year, this is why. Back in Napal for the 20th year ready to do it all again. The end of a successful first trip to the Philippines. A family with complex eye issues are given a promise and hope. Celebrations like these make the trips worthwhile. Finding solutions to the many different reasons patients are not able to receive surgery. With the team and equipment having arrived the unpacking begins. So what have we done here at the Scheer Hospital? The challenges of working in a country with a different sense of urgency. Our heart breaks as we hear the plight of some of the patients. The challenges of a working week in the remote far west Nepal. Arrived and ready to commence in Dadeldhura. The advance team arrive and things are falling into place for a great trip ahead. Further education of the local Fijian nurses improves the level of nursing care. Some thoughts and thank you's on Sally's first OHI trip. Patients often gain more than just their health after surgery. The patients are more than just numbers to the OHI team. We have been humbled by how the local people have shown their gratitude to the OHI team. Some of the beauty of Tonga. Lives have been changed and the patients go home in good health. Two of the original Tongan heart patients return and share the stories of the second chance they had a life. Thoughts, thank you and praise from the Project Leader of the Tongan Open Heart International project. The physio's are working hard to get the patients up and moving after surgery. Tales from the ICU from two of the team. It takes more than just Dr's and nurses to make a trip successful. The second specialty supply on a dash to get to the airport on time. Going above and beyond the call for duty to get some much needed supplies to the airport on time. Rounding up everyone for this years team photo. Highlights of the Tonga trip from the Anaesthetic nurses. The screening team for this years Tonga trip head for home as week two people arrive. Want to find out about a trip, ask and get an response. A visit from a past patient reaffirms the reason why we do what we do! The theatre team has been hard at work in Tonga. The first patients are discharged after surgery, some with a fast recovery. We're celebrating Mother's Day in Fiji. Our visit to Tonga coincides with the Australian High Commissioners visit to Tonga. The local nurses displaying their Tongan rugby colours. Local nurses furthering their knowledge of cardiac care. One of those only in Tonga moments. A formal welcome to Open Heart International and Cultural Night for the team. The role of the ICU team is critical in determining how many patients can be seen by the OHI team. Fixing some congenital heart defects is possible, even in babies only a few weeks old. Open Heart International brings patients from small pacific nations together for the opportunity to receive life saving surgery. Vaiola Hospital is the main hospital in Tonga and is undergoing some great improvements. With 24 hours till surgery is to start, the boxes need to be unpacked and the equipment setup! The equipment and staff have left for Tonga about to start what will be another successful Open Heart International visit. Thoughts, thank you and praise from the coordinator of the Papua New Guinea Operation Open Heart project. Answering the call to volunteer reaps benefits not only for the cause but for the individual too. The theatre team finish up at the end of a successful surgery week. Volunteers discover their own way to assist the people of PNG on subsequent visits. The ongoing training of local ICU staff is reaping rewards as Open Heart International take over the general ICU ward and help create another for a week. Transformations on the post-op ward with patients and staff. Operation Open Heart contributes to improving the quality of healthcare in PNG through training local staff. 6 month old heart patient Wesley is ready to go home. Insight into the theatre teams and an update on how many surgeries have been performed so far on this PNG trip. Team members, even if found at last minute, enjoy the Open Heart International experience! The surgery team is up and running with 6 cases now in the ICU. Cardiologist Dr. Richard Hawker has been traveling to PNG for 25 years and was recognised for his contribution. All of the PNG team have arrived from all over Australia and the team meeting is chance to meet and greet. The rest of the OHI team arrives in Port Moresby greeted by traditional dancers and ready for the week ahead. The start of a trip happens when the equipment leaves the warehouse! It is the end of the Rwandan Open Heart International trip and the logistical puzzle is back to get the equipment home. The last night shift gives time to reflect on the patients and the experience of Open Heart International's trip to Rwanda. Some observations about the King Faisal Hospital and improvements that have been seen by the returning Open Heart International Biomedical team. Hear how the Open Heart International trip to Rwanda rewards more than the children of Rwanda, but the lives of the volunteers too. Thoughts on the logistics of an Open Heart International trip and the balancing act of who is able to be on the surgical list. Musings from Eleanor Mennie on life in Rwanda and the patients currently on the ward. Insight into the pediatric intensive care unit and the challenges they can face. Ange, a cardiac patient, is out of ICU and on track for a full recovery. Insight into the operating theatres and surgical teams during the Rwandan Open Heart International trip. While the focus of Open Heart International is on the cardiac patients, the families and parents of these patients carry the stress and worry. The cardiac patients are recovering well and there is plenty of fun to be had on the ward! Sometimes equipment can not be fixed and a solution needs to be found to continue the life saving work. Insight into how heart conditions affect the quality of life of those suffering and the difference surgery makes. Community spirit in Rwanda is fostered through community service work. Sometimes Open Heart International isn't the only event taking place at the King Faisal Hospital. This post is by Steve Woods, Rwanda Team Blogger. Muhamuda needed less than 24 hours in the ICU, and is now happy (with her relieved Mum) out on the ward. Words on the Rwandan OHI trip from the project leader Russell Lee. First impressions of the Open Heart International trip and the Kigali Memorial Centre. A free day for the ward staff is an opportunity to see the a little of the city. The initial impressions of an Open Heart International trip from from Shirley Wong on her first OHI trip. The success of a trip relies on excellent volunteers and includes biomedical engineers to keep the equipment working. As the team arrive at the King Faisal Hospital in Rwanda, the logistics of equipment and care are organised. The start of the Rwanda 2012 Open Heart International project. The first few days of the Rwanda trip are busy unpacking and preparing for the week ahead. More than just heart surgery, Open Heart International performed Angiograms, Angioplasties, Implantable Defibrillators, Atrial Septal Defect closures and Pacemaker insertions during their time in Myanmar. The success of a trip relies on the excellent volunteers and includes ICU nurses and Physiotherapists. Open Heart International Team anaesthetics presented at the 10th Biennial Congress of Myanmar Society of Anesthesiologists. Open Heart International in Myanmar provides many education opportunities so local health practitioners improve their knowledge and best practices. The success of a trip relies on the excellent volunteers like Paediatric Anaesthetist, Matt Crawford. Bronte Moules, who is the Australian Ambassador in Myanmar, visited Yangon Military Hospital while the Open Heart International team was in town. Inside Yangon General Hospital and more information about the people that help make Open Heart International trips a success. More on the walk to Yangon General Hospital. Some observations about life in Myanmar and improvements that have been seen by the returning Open Heart International team. More on the walk to Yangon General Hospital and the hospital grounds. News from the small Open Heart International team that traveled to Pyin Oo Lwin and a huge thank you to the companies that make it all possible. Some observations about the Mandalay General Hospital and health care in Myanmar. Warwick Creeper introducing the upcoming Myanmar trip and thoughts from past trips. Final thoughts on Myanmar and the team that went. The trip to Cambodia is about to start with some background to the country and past trips. Heading to Cambodia with and urgent email from customs. The team has arrived in Cambodia but there have been freight issues. Some initial impressions of the hospital and surrounds in Cambodia. Dr. Phil Roberts take on patients and the experience of working in Cambodia. Chea's day for surgery has arrived. Seeing the transformation from surgery of the sponsored child Vath. An update on Chea and how he is recovering post surgery. The quick recovery of the children of Cambodia after heart surgery. Thoughts and experiences of Carolyn Wilkinson on the 2013 Cambodian cardiac trip. The roundup of the successful cardiac trip to Cambodia. Catching up with past patients during screening week. Michael test with a really long title name to be tested here yes it’s still going like I said it’s huge! It was a snow joke as a full-sized sculpture of a Volkswagen Beetle received a parking ticket in Germany recently. Here comes the summary for the Great News article. It should be working perfectly. All patients are progressing well in PNG. The youngest patient this trip at 8 and a half months, Emanuella is keeping the nurses on their toes. Many of the families are thankful to the team for the surgery their family member has received. 16 month old Prosper has had his operation and his Mother now hopes for a bright future. Onesmo Mhewa, along with paediatric Surgeon Godwin Sharau, and cardiologist Naizihiiwa Mnong’one joined the team in Rwanda and will now host the team in Tanzania this week. Change a life Open Heart International provides the opportunity for those living in developing countries to receive specialised healthcare that they deserve, yet cannot access. Find answers to your questions about our work and the impact your support is having. The team has arrived in Myanmar, here is some background information about Myanmar.